Here is a cover performance of Steve Vai's 'The Crying Machine' based on the transcription from the Trinity College Grade 8 Exam Book. Many of you know that in addition to EMP, I also teach privately. I have been teaching since 2001, and I have had students of all ages, and levels, from little children, to teenagers, to professional players, to retired "bucket-listers", and everyone in between. I really enjoy teaching, and sometimes, one of the projects I undertake with some of my students, is to prepare them to take guitar "grade exams". I usually use the "Rock & Pop" exams by Trinity College London, because they have a nice selection of performance pieces, plus good quality transcriptions and backing tracks. 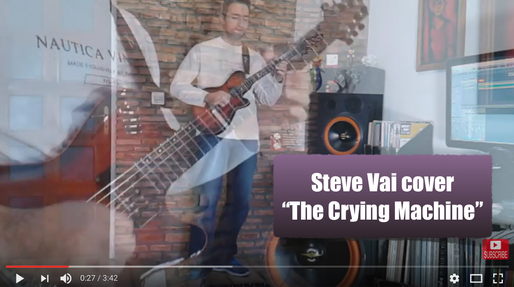 A popular choice for my students has been "The Crying Machine" by Steve Vai, which is one of the options for the Grade 8 Guitar exam. So back in 2014, I decided to record a performance of this, so that my students can watch, learn and be inspired, when they are at home practicing. But I realized that some of you might enjoy this as well, so I decided to share this with my EMP viewers! In this recording I play the piece exactly as it's written in the Trinity transcription, with the exception of the solo (at 1:45) which is improvised. Steve Vai is a virtuoso rock guitarist who, in the 1980's, set new standards in technical ability. His playing is characterized by his use of rapid scales and arpeggios and his extensive exploration of effects, processors and the tremolo bar - all helping to create a wide variety of sounds. "The Crying Machine" is taken from Vai's 1996 album Fire Garden. It's a very melodic song which incorporates many of Vai's expressive devices. It's also not too difficult to play, which makes it an excellent choice for intermediate guitar students.